Here is the full story of the ad. After over thirty years, I still have nearly total recall about the photo shoot. This job was shot in very early 1978. I received a phone call one day about this job - I can't remember if I was called by the photographer or the ad agency that produced it. But I said I could certainly do the makeup for a job like this, and after we agreed on a price, I sat down with the agency people, art director and photographer at a production meeting. They told me that they were going to have some "live" people dressed as detectives/crimefighters and that other images would be "cartooned" into the photo. So far, so good. We started discussing the individual characters. When I mentioned that I could create a makeup that could turn a non-Asian into Charlie Chan (thinking they would be casting à la Oland, Toler, and Winters), the art director (a rather loud, abrasive fellow) turned purple and sputtered, "No! NO! He's gotta be an Asian! He must be Chinese! He can't be Caucasian! No!!" Fine. It was their show, and they were free to cast whomsoever they wanted. I'd work with whatever face I was given. Came the day of the shoot, and I was ready. When I arrived at the photographer's studio, though, I found that there had been a bit of miscommunication and not one, but two Sherlock Holmes models showed up. And one of them, Jan Leighton, was well-known to me as we had worked together several times. (In fact, one year later he would go on to play Charlie Chan himself in the Macy's newspaper ads shown below.) After a hurried little conference in a corner of the studio between the "powers that be" (excluding me, as I was not one of the producers), one of the Sherlocks - the better one, actually - was politely dismissed (he'd get paid anyway), and Jan Leighton got the job. I quickly put a little makeup on him, as well as the models playing Batman and Robin. One, two, three, and they were done. Then, the art director brought our Charlie Chan over to the makeup area and introduced him. They had searched and searched through all the talent and modeling agencies in the New York City area and had been unable to find a heavyset Asian/Chinese professional model or actor. Seems there were none to be had, no matter where they looked. Eventually someone found this gentleman - he was Chinese-American, somewhat heavyset, definitely a bit too young, and not a professional actor or model at all; he was an insurance salesman. Alright, fine; a face is a face is a face (as Gertrude Stein is rumored to have said). He sat in the makeup chair and behind me I heard the art director bark, "Awright, now make him look like this!" I turned around and he thrust a sheet of white paper into my hand with - you guessed it - a caricature of a grinning, toothy Warner Oland! It looked somewhat like the Charlie Chan image you use on your site's homepage, albeit without the hat. Damn fool. I just rolled my eyes, nodded my head and got him away from my area as quickly as I could. Finally, with everyone made up and appropriately costumed, the crime fighters were posed and photographed. It was all over in less than an hour, and everyone cleaned up and went home. But they never even sent me a "tear sheet," no pre-publication example of how it all would look. This was a bit upsetting. Eventually I found out that Newsweek magazine was going to run the double-page ad, and that's how I got a copy. But, when I looked at the final version, my jaw dropped. It had been heavily retouched, and the faces now looked exaggerated, almost cartoon-like. 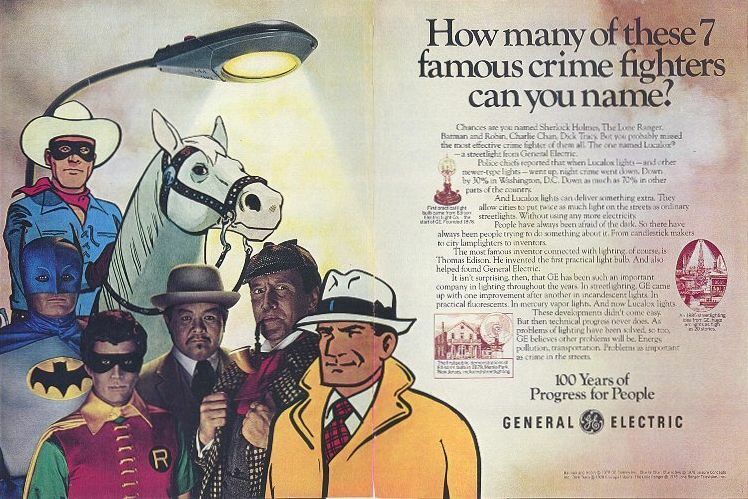 Batman and Robin looked like spray-painted department store mannequins, Sherlock's features had a more "drawn-in" quality and Charlie Chan had more obvious lines added to his face. All in all, it wasn't pretty. Not quite what it all looked like in the photographer's studio. Oh well, I said to myself, nothing to be done; this is what happens when you're an artist-for-hire. And besides, I rationalized, GE was a major corporation and the ad would look good in my portfolio for that reason. And that's the story of the ad. These are not the ads from the NY Times (more on those in a moment). These two 1979 ads ran in the NY Daily News on February 25 and March 1, respectively. They are not the exact same as the versions that ran in the Times. 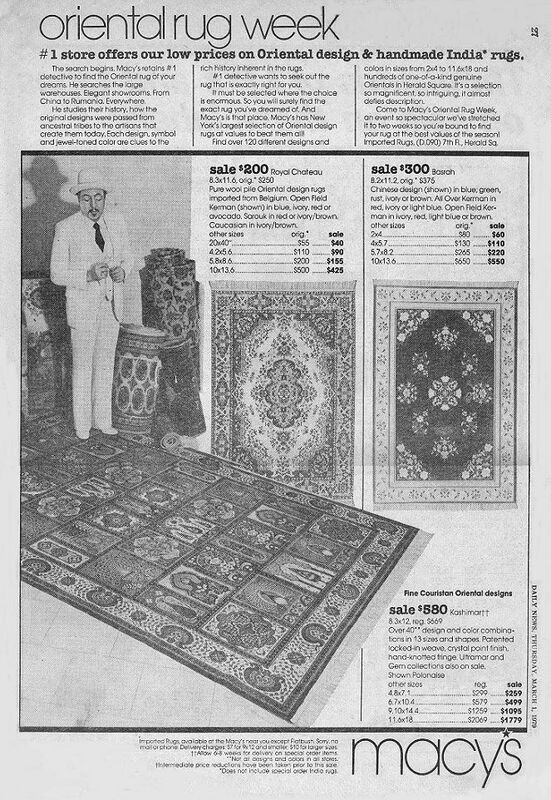 But meanwhile, I thought you'd want to see the ads from the Daily News. But here's the thing: the ads that ran in the Times were better. 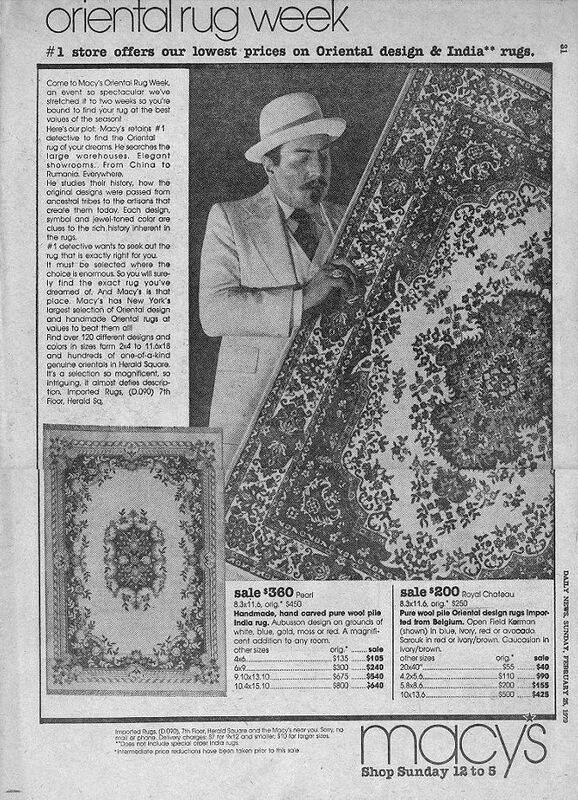 There were four Times ads (as opposed to two Daily News ads), the photos themselves were slightly different and there was an amusing serialized "story" to them that was not really explored the same way in the Daily News. Also, there were other people in the Times ads: Number One Son and a suitably frightened-looking heroine.